Ghosts are so cute on little girls for Halloween! 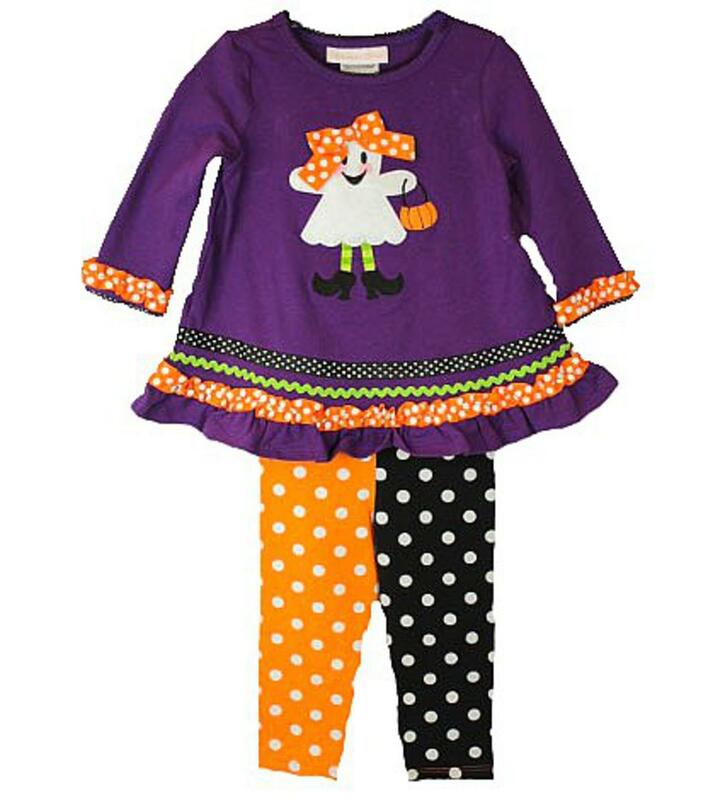 The purple longsleeve tunic shirt has a white ghost applique with a pumpkin basket and an orange and white polka dot bow. This girly shirt has four rows of ruffles around the bottom of the waist. There is black and white polka dot ribbon, green squiggle ribbon, orange and white polka dot ruffle and purple ruffle along the trim. There is black picot on the neckline and sleeves. And the matching orange and white polka dot ruffle along the sleeves. There are matching leggings that the left leg is black and white polka dot and the right side is orange and white polka dot. This soft outfit is 95% cotton and 5% spandex.